Uttarakhand Public Service Commission (UKPSC) Board has released an official Notification @ www.ukpsconline.in about the UKPSC Lecturer Recruitment 2018 Process and is ready to select the 917 Lecturer Posts from the Uttarakhand State. The Online UKPSC Lecturer Application Forms has been started from 04th September 20187 and the last date to apply for this UKPSC Lecturer Job Vacancies are 25th September 2018 till 11:59 PM. 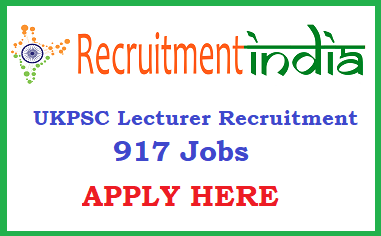 A lot of UKPSC Lecturer Job Vacancies have been Proceeding by the Uttarakhand Public Service Commission Board almost 917 Jobs as a lecturer Post. All the Details about the UKPSC Lecturer Notification we are going to describe here in a very simple and a comfortable manner. UKPSC Lecturer Recruitment Date extended!! UKPSC Lecturer Recruitment Last date extended up to 10th Oct 2018. Check now. Uttarakhand Lecturer Notification has been issued by the Higher Officials of Uttarakhand Public Service Commission (UKPSC) Board on 04th August 2018. Interested and the willing Candidates who having all the essentials Criteria which is required for this UKPSC Lecturer Recruitment 2018 Process are the educational Qualification, age limit, selection Process, Vacancy Details, Application fee and the important Dates all we have mentioned at the end of this Page. Eligible Candidates have to take a look on to this UKPSC Lecturer Job Vacancies in order to settle Down as a lecture Posts by getting the Level- 8, ₹9300- 34.800 Grade Pay ₹4800 Payscale. To make the candidate’s Career Better as a UKPSC Lecturer Posts, Applicants needed to compulsory have to fill up their Online UKPSC Lecturer Application Form within the End Date of 25th September 2018 till 11:59 PM. Fill up the Application in a Perfect manner. Otherwise, the Rejection of the Uttarakhand Lecturer Application Form is More due to the more number of candidates have been applying for this UKPSC Lecturer Recruitment Process. At present, the Authorities have got a lot of UKPSC Lecturer Application Forms from the Interested Candidates. So read out all the instructions which were printed on the application and then fill up on in an ordered manner by uploading the necessary Documents in it. The candidate who are interested to get the job in the UKPSC Lecturer Recruitment 2018, they must and should have to possess the LT Diploma from recognized College/ Institution by Govt. Or B.Ed Degree from recognized University/Postgraduate Degree in relevant discipline from recognized University. Candidates who have the experience in the Teaching Field, they will be considered the more Priority at the time of the Interview Rounds. Upper age is Realcyion as per rules and regulations of the Uttarakhand Public Service Commission (UKPSC) Board. Selected candidates in this Recruitment Proces, they will earn up to Level- 8, ₹9300- 34.800 Grade Pay ₹4800 Payscale. Viewers form the Uttarakhand State, we are giving the Good and the useful News about the Uttarakhand State Govt Jobs is that Uttarakhand Lecturer Recruitment has been Advertised on 04th August 2018. As this is the state Government Jobs, candidates having the more focus on this UKPSC Lecturer Jobs @ www.ukpsconline.in. So to grab these Job Opportunities, Candidates needed to think about this UKPSC Lecturer Recruitment Process in order to get the Lecture Posts. All the Credentials we have placed at the end of this @ recruitmentIndia.in Page or they can check it on the main Official Portal @ www.ukpsconline.in. Those Candidates who are enthusiastically willing, they needed to gain the more sort of Details about the UKPSC Lecturer Notification, in which the applicant can find here only with all the Updates Links. All the Registration or the Application Links we gathered and have given here for the candidate Sake. Knowing all the essentials Details, move to the forward step by filling up the online Uttarakhand Lecturer Application Forms. UKPSC Lecturer Selection Process is having the Written Test/ Screening Test, Interview. Those Candidates who will be inclined after all the selection Rounds, they will be given the more priority in selection for the Uttarakhand Lecturer Job Vacancies. Candidates can also get the Syllabus & Previous Papers Here.